Stata stores its personal ado-files in ~/Library/Application Support/Stata. Versions of Mac OS X 10.7 and newer hide the ~/Library directory by default to prevent accidental deletion of critical files that applications may need to run. Mac OS X’s new behavior prevents users from easily accessing their personal ado-files from Stata's graphical interface and the Finder. Here are a few methods to make the Library directory temporarily visible. 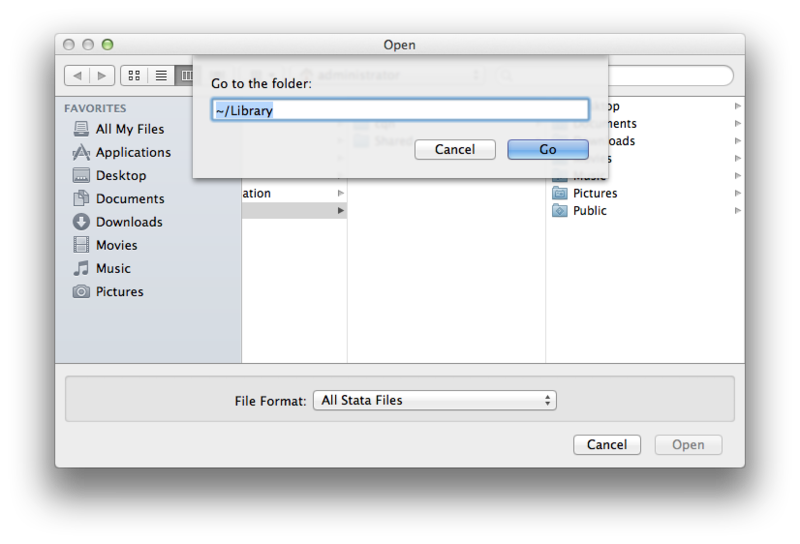 From an Open or Save dialog in Stata, press Command + Shift + G and enter ~/Library to temporarily access the Library directory in the Open or Save dialog. From the Finder, press Command + Shift + G, and type in ~/Library to temporarily access the Library directory in the Finder. From the Finder, hold down the option key while clicking on the Finder’s Go menu to show the Library directory in the menu.